Swords from Europe and especially Spain are thought to be the finest in the world. The Patriot Sword was created in memory of the 9/11 Twin Towers disaster. Terrorist attacked New York September 11th, 2001. 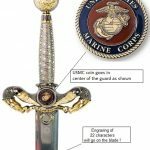 From the top (pommel) to the tip of the blade, this exclusive sword depicts in symbols the indomitable spirit , love of freedom, liberty and justice of the American people. Our service personnel put their lives on the line every day they serve. This Patriot is one beautiful way to commemorate their service. These items are predominantly purchased by people who want to create a unique military gifts. The blade on the Achievement are approximately thirty nine inches long. This allows us to engrave certain text relevant to the sailor, soldier or marine. These items are created and designed for heroes and warriors. The military sword has a rich history that dates back to 1775 when General Washington on Cambridge Common drew from one of the blades he used and formally took charge of the heterogeneous Continental Army. Currently there are many types and that grouping them can be a hard nut to crack. All the same some of the most commonly known swords include: ceremonial , army , navy , military and Marine Corps. Authenticity and great attention to detail is paid in making and selecting all our Swords. All our battle ready hand forged replicas are not only beautifully constructed but also affordable. Each and every sword in our site is made of superior hardwood and is evenly hardened/tampered and well balanced. 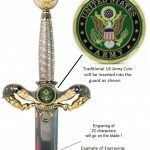 One popular example of army sword is the United States Army NCO sword that was adopted by the American war department in 1840.The sword has been worn by Army Personnel for over a century and it is mainly used today for presentations and honor guards such as change of command and PC’s. Before 1868 the Army NCO sword had a leather scabbard and the highly valued traditional sword is preferred by most Army sergeants. Our NCO ones are designed using only genuine steel and we also engrave your name and special dates on the sword. Ceremonial ones are mainly used for ceremonial purposes to display authority or power. They are commonly used as part of dress uniforms and in parades. Although they are designed like the real weapons used in combat, they are rarely used. Their decoration and finishing are typically designed to show power and status and to have an impressive appearance rather than an actual weapon. All our ceremonial swords are created with precious metals which make them very eye catchy and stunning.